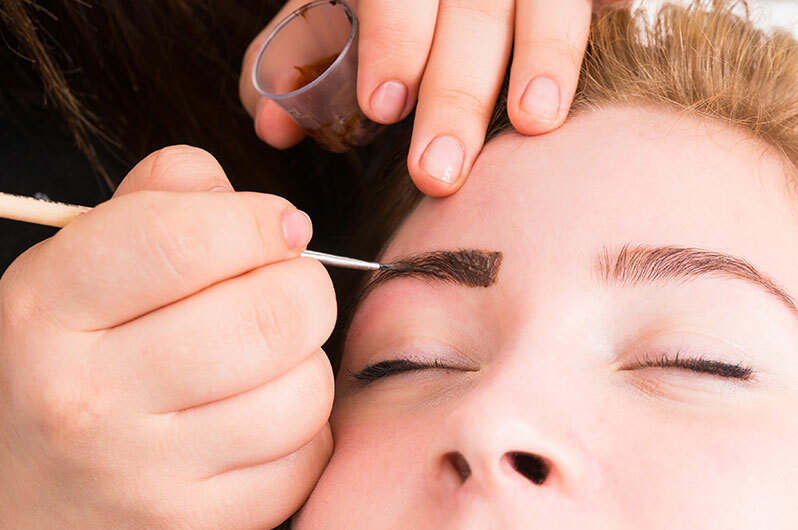 If you have been struggling to define your eyebrows, and wish there was an easier, more natural looking solution, then eyebrow tinting may be right for you. At Urban Soul Salon and Spa, we provide high quality, long lasting eyebrow tinting services. Our products are salon grade and high quality. The following article answers some frequently asked questions regarding the eyebrow tinting procedure to help you decide if it is the right beauty enhancing service for you. Eyelash Tinting: What is it? Eyelash tinting is a process where the hairs of the eyebrow are temporarily tinted a darker shade. This is done to achieve the look of thicker, fuller brows without any makeup. The eyebrow tinting formula picks up little hairs that are too light to be visible to the naked eye and dyes them darker so that they help fill in the natural brow. Eyebrow tinting relieves clients of having to fill in their eyebrows every day with powders, creams, pencils and gels. What Kind of Dye Is Used? Eyebrow tinting formula is made of a non-irritating vegetable based formula that minimizes the risk of any reactions on the sensitive eye area. Typically, the tint will last on your eyebrows for up to 6 weeks. This will vary depending on your lifestyle preferences. For example, if you sweat often and go to the gym, you may need to get your brows touched up more often. If you do not swim or exercise, your brows will last longer. The eyebrow tinting procedures takes approximately 10-15 minutes total. The brows are first cleaned and any excess makeup or oil is removed. Then, the skin around the eye is protected using either vaseline or protective sticker guards. Afterwards, the dye is applied and left to set for at least 2 minutes. Finally, it is rinsed off and the client is ready to go. What Are Some Benefits of Eyebrow Tinting? Clients whose lashes are naturally very light and sparse will benefit from enjoying an eyebrow tinting service. Similarly, those who do not enjoy applying makeup yet want a natural looking, defined brow will also benefit greatly. It is a great option for those people with busy schedules who do not have time to touch up their makeup often. If you are very active and perform many sports activities, this is a great option that is durable and long lasting. It is clear that this salon service has many benefits and is perfect for those who lead a low maintenance, active lifestyle. If you would like to find out more about the benefits of eyebrow tinting as well as to obtain a free quote, call Urban Soul Salon and Spa today and speak with a knowledgeable staff member. If you want worry free mornings that do not call for extensive makeup application, consider investing in an eyebrow tint. This low maintenance, long lasting solution will not let you down!